Morel mushrooms are a wild mushroom variety that to my knowledge can’t be farmed or cultivated. Which is truly a shame, because they are one of the best mushrooms out there. When I see them in the store, I forget whatever I had planned for dinner, because it’s going to be morel mushroom night come hell or high water. You can prepare them in a ton of different preparations, but one of my favorites, that really highlights their flavor and texture, is to simply sauté them with some pasta. 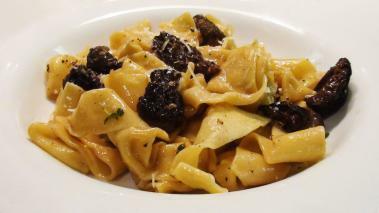 In this recipe video, I use pappardelle, and make a mushroom sauce with the morels. It is rich, and delicious, and I hope you enjoy it as much as I do. Use a good amount of butter. Maybe not the healthiest thing to do, and you could use olive oil, but morels and butter go really well together. With the broad pasta noodles and rich sauce with mushrooms, a little bit of this dish goes a long way. Certainly you can use any mushrooms you can find, but if you’ve got the morels, I highly recommend them. Great recipes. I'm eosecially looking forward to trying the chantrelles and shallots with thyme. One thing i did want to comment on is that chantrelles are the mushrooms which cannot be farmed (at least without a team of scientists). They sell kits to grow morels online. Thankfully chantrelles are much easier to find in the wild and along with certain bollettes (porcini) are somecof my favorite wild edibles to cook with.